I’m a huge strawberry ice cream lover but honestly I love any kind of ice cream, especially if it’s homemade. I’ve only once made homemade ice cream and that was on the off chance that it would work without an ice cream machine, and it did. Growing up my parents really didn’t buy much ice cream as it wasn’t a staple that we needed in our house. Having ice cream might have been a treat when we were out shopping or travelling but you’d never see it in our grocery shopping cart. My parents were just as involved with a grocery budget as Mrs.CBB and I are today. My mum made almost all the sweets in our house and that’s why I try to the same in our home. I was always watching her in the kitchen or helping my dad around the house and garden. Every once in a while I get an email from a CBB fan who wants to share one of their recipes with our community of frugal fans. Today I have one of those recipes to share with all of you. Last week Pat Comeau Ciulka sent me this super easy ice cream recipe that anyone can make and the best part is you don’t need one of those fancy ice cream makers either. That’s right you don’t need an ice cream machine which is great because, I don’t own one! Every summer we like to pick fresh strawberries from a local farmer where my mother-in-law lives. This strawberry ice cream recipe will be the first recipe we will be making once we pick a few baskets full this season. It’s amazing how many people would rather buy ice cream at the grocery store which can get very pricey unless it’s on sale or there’s a really good coupon available. If you love some of the popular grocery store ice cream brands such as Ben and Jerry’s, Chapman’s ice cream (Note: If you email Chapman’s they will send you a coupon for $5 off Ice cream once per year) or Haagen-Dazs ice cream you know a small tub will cost you about $5-6. They are certainly worth the money you pay because the companies use the best ingredients you can get but you can easily make your own ice cream at home for a fraction of the cost. Even if you do invest in an ice cream machine it’s worth the money if ice cream is a treat you often serve at home. When you read today’s recipe you will notice there are only 3 ingredients fresh fruit, cream and a sweetener of choice, that’s it. There’s no eggs in this ice cream recipe either so if you aren’t able to eat eggs this is an eggless ice cream recipe you will want to tuck away for those times your sweet tooth is calling. You will also notice that Pat doesn’t use sugar in this strawberry ice cream recipe. You could add sugar if you’d like to add more sweetness to the ice cream or sweeteners as she suggests. Every so often we are grocery shopping and we see the 35% cream on sale for $1.99 or even less and that’s the time to buy it. This will be a great recipe to test with cream we get on sale. If you don’t have fresh strawberries in your area or if you want to make this strawberry ice cream and the strawberries are not in season simply use frozen strawberries instead. I’m pretty sure that you could add any flavours you’d like especially if you don’t fancy strawberries. If you’re a fan of bananas you could switch this recipe up to make a banana ice cream or chocolate ice cream. I could make this one long list of flavours but you get the picture. What are some of your favourite ice cream flavours? 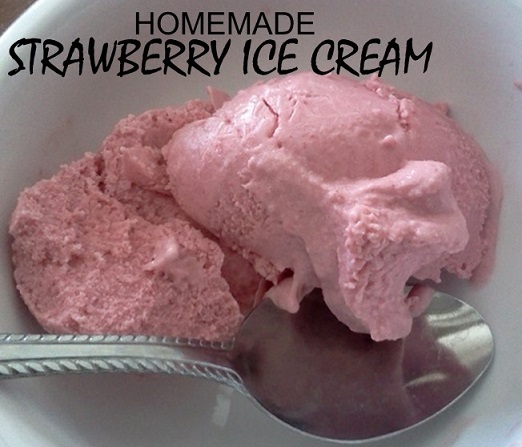 Do you make homemade strawberry ice cream or other flavours? Thanks Pat for sending me this simple strawberry ice cream recipe for all of us frugal foodies. If you have a recipe that you created and want to share email it to me with photos and it might just get published on CBB. If you love ice cream but don't care for the cost to your budget you will enjoy how simple it is to make homemade strawberry ice cream on your own with this fantastic homemade ice cream recipe. Place frozen berries in blender or processor add cream and sweetener and blend until smooth. Place in a glass bowl and freeze for three hours. The picture above is made with sugar and 35% cream but you could use kefir, coconut milk or plain Greek yogurt as well. To make it a bit more interesting you could fold in extras once you put it in the bowl. Here are some ideas: cookie crumbs, vanilla, whole chopped fruit, sprinkles, chocolate chips, coconut or nuts. If It is well covered it will keep for 2 weeks in the freezer. Mine doesn’t last that long! Another quick tip to mention is that if you enjoy ice cream cake desserts and you make your own cakes add a layer of this strawberry ice cream to make it decadent. It’s a perfect ice cream dessert for any occasion. Simple and yummy! An easy “ice cream” recipe as well, is simply taking your favourite single or combo of frozen fruit for example, bananas, strawberries, sticking it in the blender and voila! Yummy and healthy! I especially like banana, as when it is frozen, it doesn’t have a very strong banana flavour, so you can add vanilla and a bit of sugar for vanilla ice cream, or cocoa powder and sugar to taste for chocolate ice cream.